A good while back I got the lovely present of some top quality Matcha - and now I've finished my old tin I've moved on to this. I've become quite fond of the odd green powder, and while it's not an everyday treat it does give you that lovely slow burn of caffeine for 4 hours or so. Plus it tastes amazing too. As you can see it's kind of settled during transit - what the photo fails to capture is the green mist that rises as you open it - you can see some has settled on the counter - curse the ring pull opening system! For a quick blast I do love adding a scoop to a shot of almond milk and blending it. Unfortunately the little cocktail spinner is at work so I've had to mix by hand. It's lumpier than I'd like it but it still has that amazing blend of the sweet almond milk and the harsh deep matcha tea. Hopefully this summer I'll get to mess about with it a bit more and make green tea ice-cream and other kinds of smoothies. Maybe I need to acquire some cheaper less refined tea for that, and save this for sipping ceremonially. When I first picked up this can I thought it would have been brewed with honey. 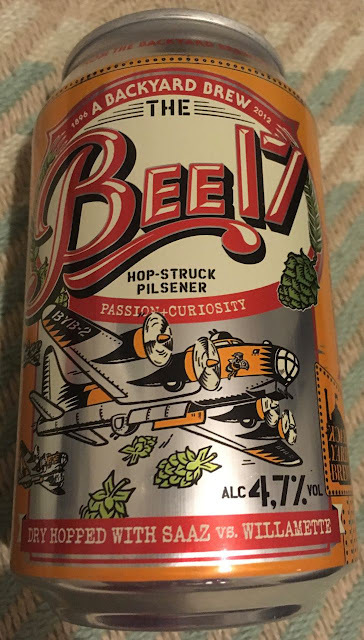 Produced in Falkenberg, in Sweden, by the Backyard Brewery this Bee 17 'Hop-struck' Pilsener says nothing amongst the wealth of information on the can about honey. There are B17 Flying Fortresses on the front of the can coloured like bees! Asides my confusion, this 4.7% Pilsener, was dry hopped with Saaz and Willamette, and brewed with Pilsener and Caramel malts. On opening the 330ml can there was a floral smell from the mixture of hops and a light sweetness from the malts. Despite being straight from the fridge this striking golden beer, had a sort of instant warmth from the depth of flavours. The malt Pilsener followed by sweet caramel hit my tastebuds first and then the floral bitterness from the hops. This is a beer that's full of flavour and I'm sure a little mischief. If this craft beer was made in someone's backyard, then it's certainly a backyard I'd like to hang around in! These biscuits reminded me of some Maryland biscuits we wrote about a couple of years ago, Soft Bakes. If I’m totally honest I had to Google to make sure we hadn’t reviewed these already, but these biscuits are new to me, and are different to the similarly packaged Soft Bakes. With years of blogging and a poor memory I’m surprised I don’t need to Google like that more often! 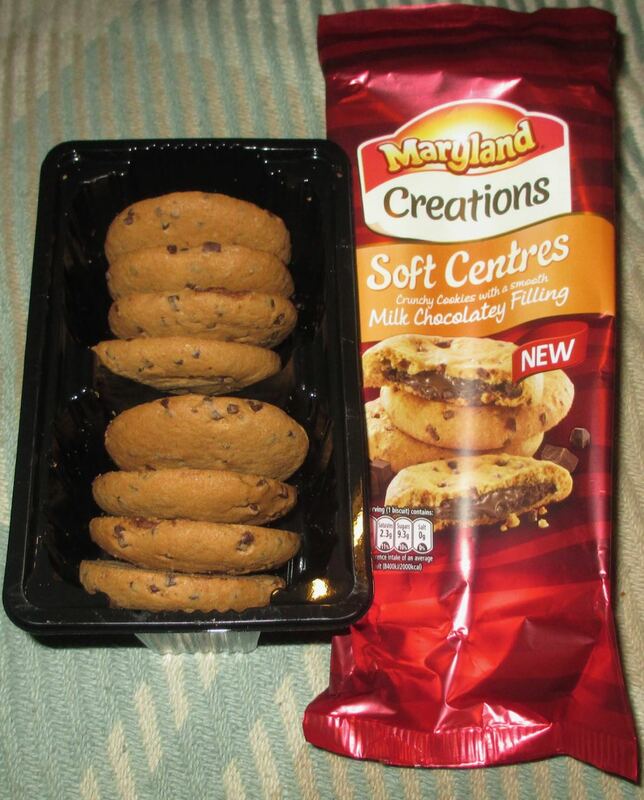 In fact these new Maryland Creations Soft Centres are not soft, the biscuit is firm and crunchy, but the soft part is in the filling in the middle. Once the wrapper was off I did think the number of biscuits compared to the size of the outer packaging was a bit ungenerous. I mean they were well spaced out with the black plastic tray, and not as big as I’d hoped. I broke one of the Maryland Creations Soft Centres Biscuits in half, they are quite tough cookies so this wasn’t that easy, but I wanted to have a look at the centre. I was surprised by how gooey the filling was, it wasn’t quite runny, but it did ooze a little. 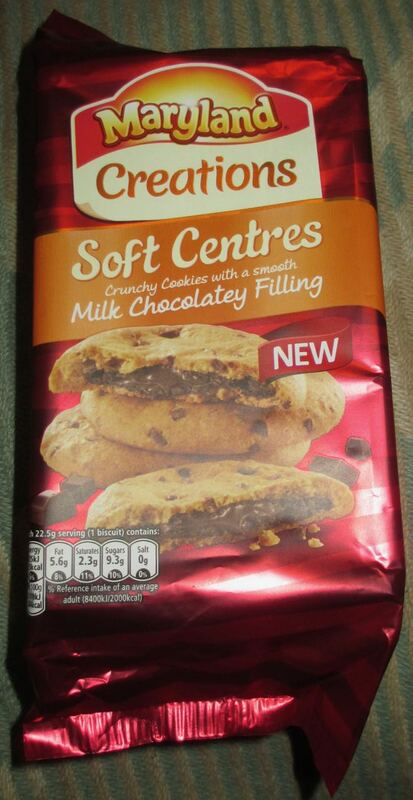 The biscuit flavour was really nice, they had a good baked taste and plenty of chocolate chips which are perfect for my sweet tooth. I have always loved a mix of textures in a product, so this was a success too for me. The edges of the biscuits were quite firm and crunchy, but the best bite is the one in the middle where with the chocolate centre is, the texture here is nicely mixed. 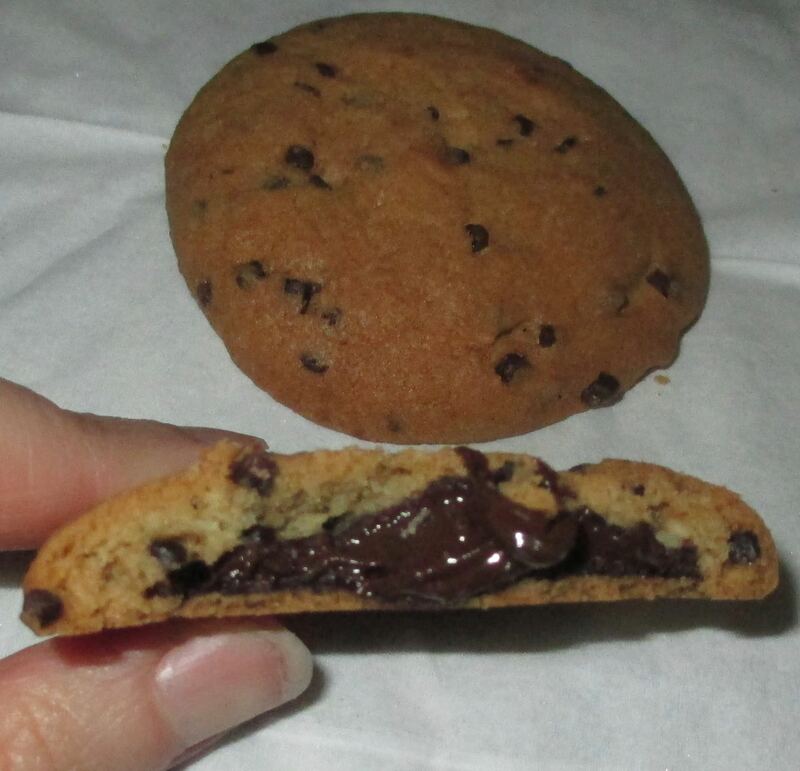 The harder shell on either side of the gooey chocolate works very well, and you properly experience the soft centre. Plus your mouth gets a shot of chocolate filling, that makes the whole bite totally divine. There was a time, in my teens when Pasta was the main thing I ate. Pasta for every meal that wasn't breakfast cereal. I still maintain that it's better than bread, but I do now appreciate that it basically has no nutritional value (the same as bread). That said I do crave the stuff occasionally and love it when I get a crazy new style to try. Here we have from Italy a bag of misshapen shells in all kinds of colours. It's also slightly thicker than regular pasta so offers a few more fiendish textures. Using sauce here highlights the issue with Quattro coloured pasta as it masks its magnificence. I think I slightly over cooked it too, but it was a first go. As expected the flavours don't vary too much between pieces but it does look great and has a much more interesting taste sensation than a bag of value pasta twirls.totally present grade and I look forward to stretching this over as many meals as possible by keeping the portion size small and adding lots of other Italian style things. So much fun! 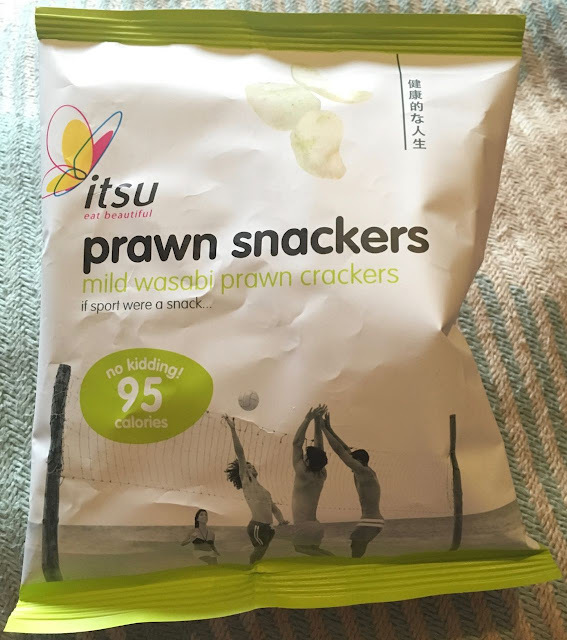 These Prawn Snackers produced by Itsu are available in two flavours, which are sweet chilli and this mild wasabi flavour. 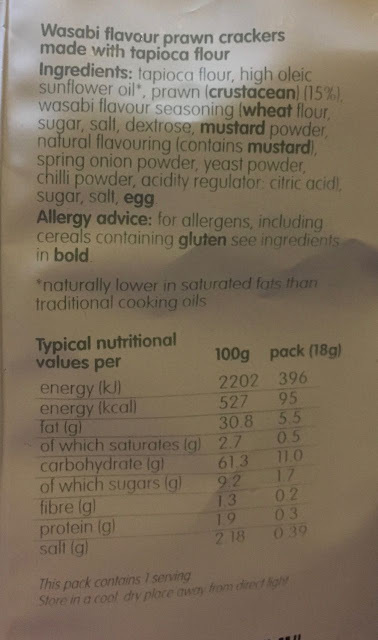 There is a wealth of information on the back of the packet; otherwise known as Shrimp Puffs, Prawn Crackers are a mixture of prawns, flour and water, which is rolled out, sliced and flash fried. I’ve tried plenty of wasabi flavoured peas and other snacks and know they can be nose ticklingly spicy, but have not tried wasabi flavoured prawn crackers. However, the caveat of ‘mild’ has calmed my nerves a tad, so I’m not expecting a sneezing fit on first taste. On opening the packet the Prawn Snackers smelt and looked just like any other prawn crackers, asides the slightly menacing green tint. However on first taste that mild wasabi mixes well with the fried prawn and flour flavours of each cracker without distracting the tastebuds away from it. There were no sneezing fits either, just a pleasant spice and step away from the normal prawn crackers on the market. After a few prawn crackers had been popped into my mouth I noticed the wasabi spice had started to build a little. Never too uncomfortably hot or even up to medium heat, but enough to know that I’d been eating wasabi flavoured snacks, and probably had a ‘lucky escape’ from the often nose hair straightening effect wasabi can have. I’d certainly have these Mild Wasabi Prawn Snackers again, especially on the side of a spicy Chinese or Thai meal. 18g packet contains 95 calories, with5.5g of fat, 1.7g of sugar, and 0.39g of salt. See photograph for ingredients. 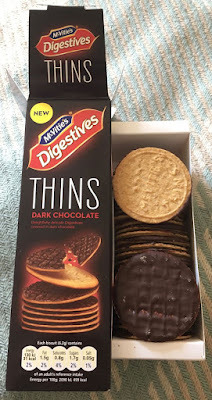 I recently tried and reviewed about McVitie's Digestive Cappuccino Thins biscuits. They were okay, but I wasn’t overly impressed, the coffee flavour seemed to overpower anything and the thin nature of the biscuit meant that the base taste of the biscuit was covered over. Interestingly several people had said to me since that they love the new McVitie's Digestive Thins and that the Dark flavour are the best. I’m always willing to give a new product idea a second chance so I picked up the Dark chocolate edition biscuits to give them the taste test. Oddly enough I loved Oreo Thins when I tried them, so I’m not averse to skinny biscuits. 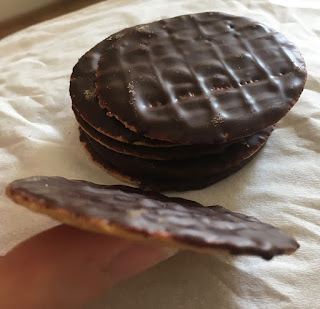 As per the Cappuccino Thins these McVitie's Digestive Dark Thin biscuits were very thin, one side was coated in chocolate and the other had a logo impressed into the thin biscuit. I gave one the taste test, and have to admit it worked a lot better than the Cappuccino variety. The wonderful wholemeal biscuit flavour shone through on these Thins, something that was missing on the Cappuccino variety. The chocolate was nice too, and had a good dark rich flavour, but the cocoa worked well with the biscuit rather than covering it. I have to admit these were a bit too easy to munch on, and I could see the contents going down very quickly. In my defence they only take a couple of bites and they are gone, so you end up reaching for the next one. I think this means they were a success, and that if you are thinking of buying McVitie's Thins I give the Dark Chocolate variety the thumbs up. We don’t live particularly near a branch of Hungry Horse, but on a recent road trip we happened to approach one at lunch time. I was really keen to try out something a bit different and I couldn’t have hoped for more. Spectre glanced through the menu and decided on fish and chips, but the burger section of the menu had caught my eye. In fact it exceeded my expectations and it was hard to choose, I settled on the weirdest sounding and ordered myself the Elvis Burger. 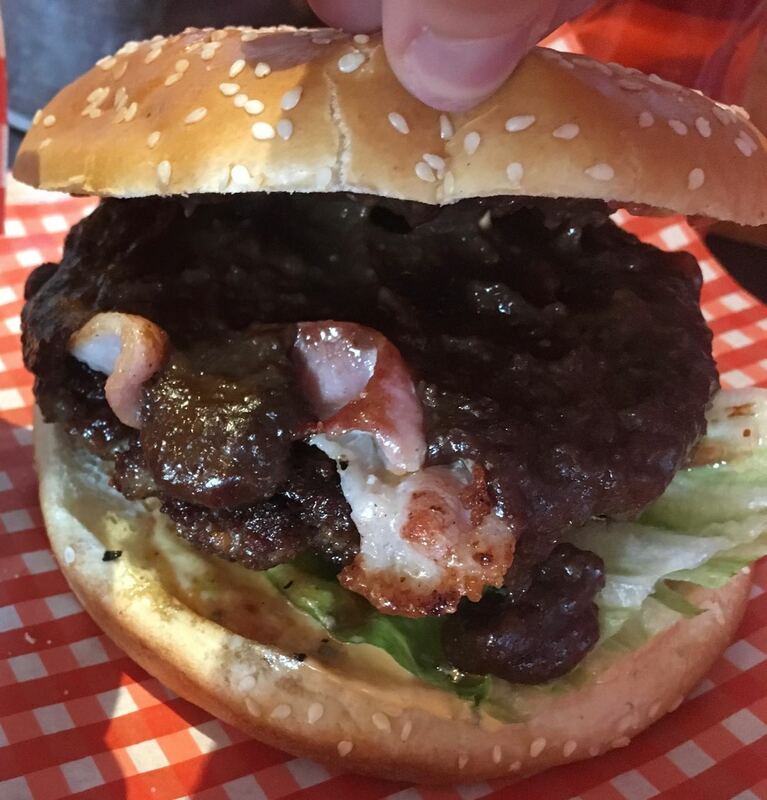 The Elvis Burger consists of a beef burger topped with bacon (ok so far), and spicy peanut sauce and strawberry jam. Its served in a seeded brioche bun. When our plates arrived I looked at the burger quite tentatively, and ate quite a few chips, and the coleslaw, before I braved an approach on the burger. 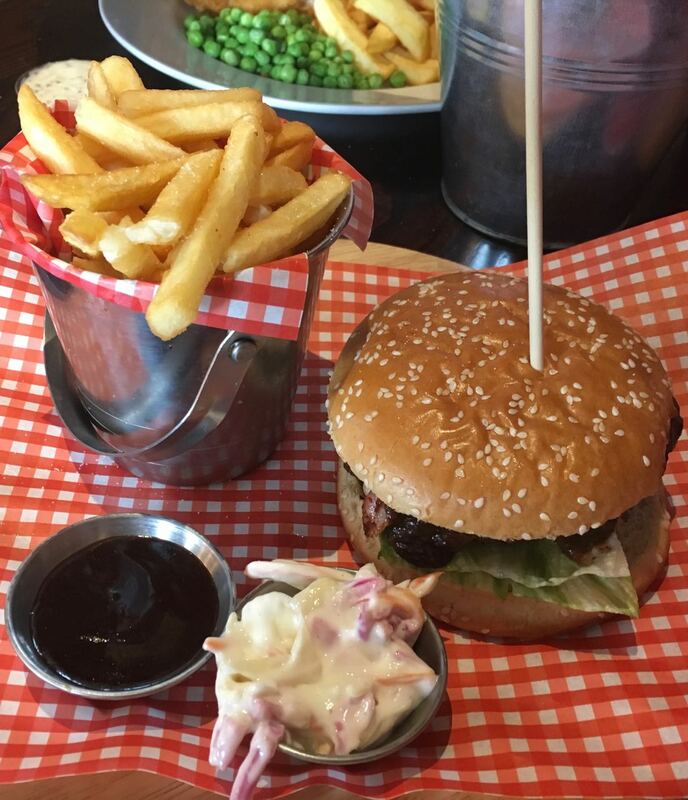 If Hungry Horse has put it on menus up and down the country the theory is it must have passed some taste test by them, but peanut and strawberry jam aren’t two things I’d ever thought I needed adding to a burger. So I picked up the burger and gave it a bite. The burger was topped with a lot of sauce and it oozed onto my hand, and was very messy to eat. You could barely see the bacon for all the sauce topping it. The flavour however was a joy. I’m not sure what I had been expecting, but the salty nutty flavour of peanut, the spices, the meaty bacon and the very subtle hint of fruitiness from the strawberry jam were a combination made in heaven. 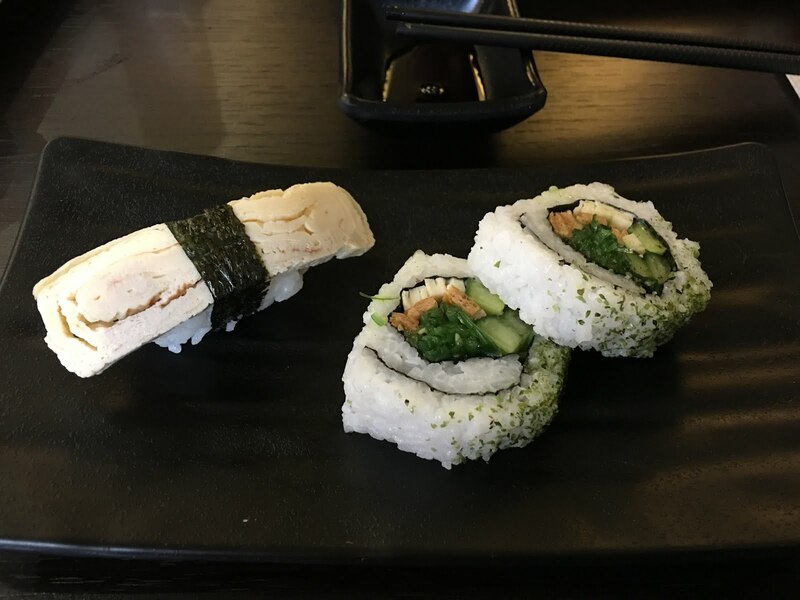 It was moreish and different, and the flavours were so different and yet extraordinarily nice that I couldn’t help but gain a big grin as I munched my way through. The burger itself was juicy with a good rich beef flavour. Yes this Elvis Burger did stay far more on the side of savoury than the strawberry jam implied, but for those brave enough to try it they are rewarded with an epic nutty topping, with just a hint of sweet to the burger giving it a fun playful touch. I’m going to have to find my nearest Hungry Horse and try more from their menu. We had a day out shopping over the Bank Holiday weekend and decided to treat ourselves to some lunch in Selfridges Food Hall in Birmingham. 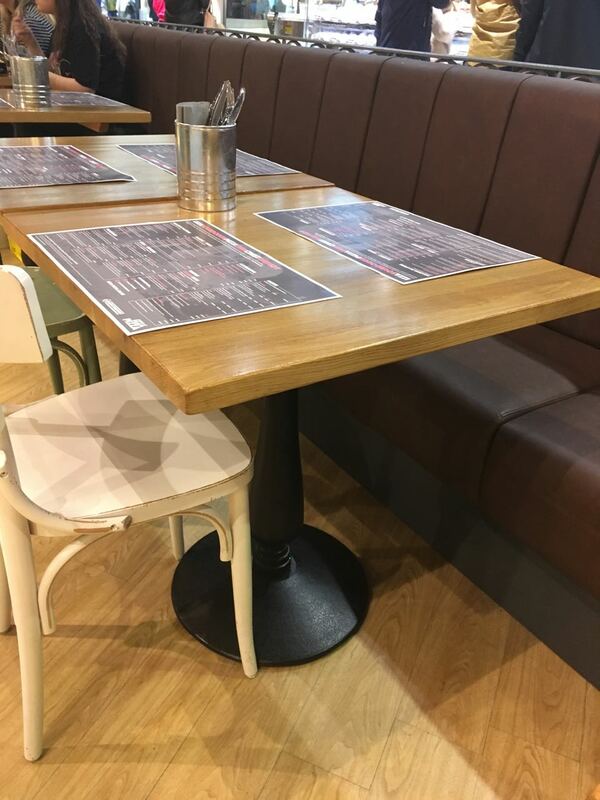 There is a lot to choose from, but new on the scene is Izza Pizza. 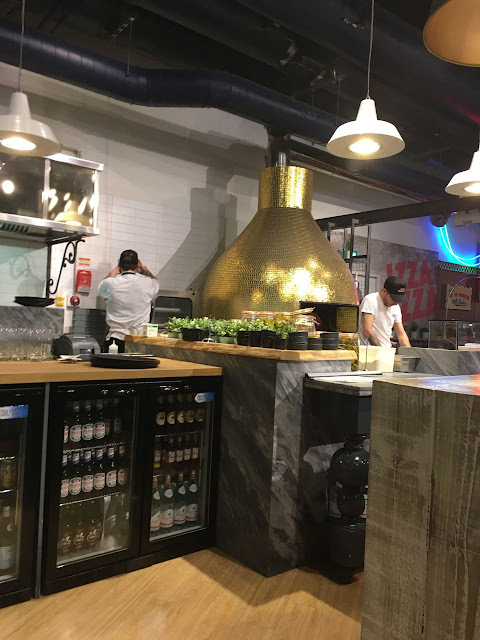 They had a spectacular pizza over on site, covered in gold mirrored tiles, and we thought we’d see what the pizza from there was like. As I like seafood, I opted for the Pink Desire, which is smoked salmon and rocket. The pizza came quickly enough and we munched on some seriously tasty olives while we waited. I wasn’t sure what to expect, but for some reason I had assumed there would be tomato sauce. 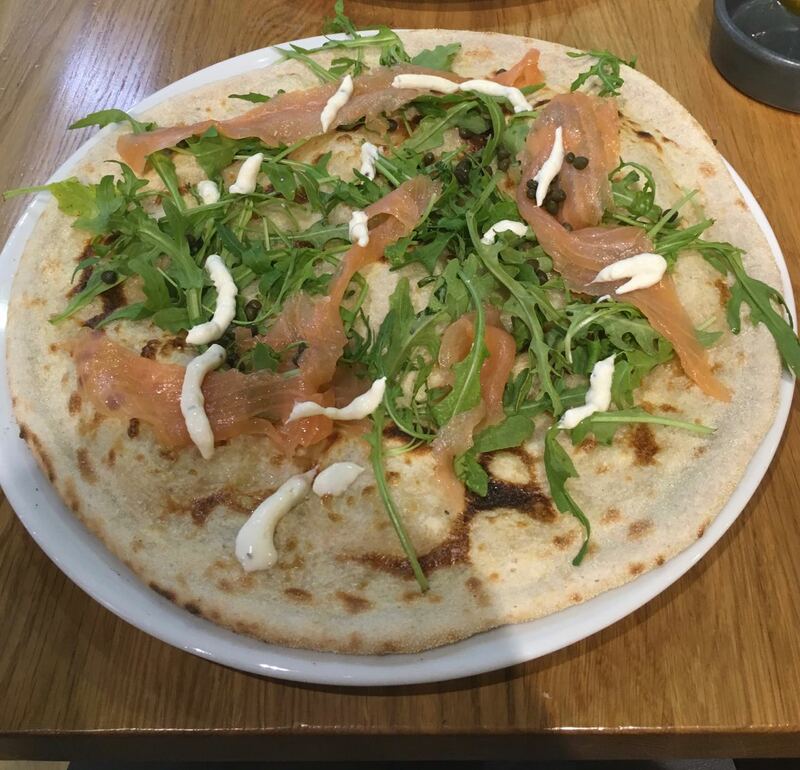 The pizza came and it was just that a base with some salmon, some rocket, some capers and a drizzle of horseradish creme fresh. No base sauce at all. It looked a little bare, but I decided to try and cut myself a wedge. This didn’t go too well, the pizza base was firm and was a bit of an effort to cut, and when I had made it through, I picked it up and the topping immediately fell off. I tried a bit of the base, before reconstructing the topping. The texture and flavour of that base was superb, it had such a good flavour and despite the trouble cutting the texture was spot on, firm and almost spongey. Due to the nature of the topping layout there were quite a few bites where there was just base, and I didn’t mind this at all when it tasted this good. You need a proper pizza oven for that kind of dough. The toppings were lovely too, the salmon was very fresh and full of flavour, and rocket added a lovely spice, and the capers had a good vinegar edge which jazzed things up. The star of the show was the horseradish creme fresh, that was both creamy and spicy and worked so well with the smoked salmon that I wondered why it wasn’t as standard as beef and horseradish. I loved every bite of that pizza and cleared my plate. I just think next time I’ll ask them to cut it into wedges for me. I'm old now. I don't get many Easter presents, I guess I'm supposed to be the one buying them (but the cats one didn't really work out). My parents however do enjoy making us some rocky road (which is the best) and this year I also got a bonus egg - that frankly looks amazing. Here we have a Moser Roth Privat Chocolatiers Luxury Ghanaian Easter Egg from The Collection - which is a very long and complicated way of saying this is an Aldi 'own brand' chocolate egg. I'm not a snob about these things (and know that our European cousins know a lot about good dark chocolate) so I was quite excited by this. They even helpfully point out where Ghana is on the map! Naturally all the guff on the back describes the chocolate in the same way that people describe wine when they don't want you to suspect their growing alcohol dependance. Maybe this is a new trend. Floral notes indeed. I suspected it may be all stripes and no tiger, but then I tried to crack the egg. Unlike most where a good squeeze shatters the egg into pleasing fragments this took a sharp blow with a kitchen knife to begin to separate - the chocolate is thick and strong with a really warm and pleasing brown colour that contrasts the titanium dioxide stripes well. The smell from the egg is pretty strong and the taste is amazing. I'm not really a fan of milk chocolate, but this has definitely got some pretty strong and unique flavours going on - maybe the wine-tasters blurb has some merit after all! There is definitely a creaminess but there are earthy tones and light, sweet flavours too. It's the kind of thing I'm glad I didn't open with friends present as it would have vaporised. One to slowly savour and hope that you can pick up similar in the regular bars from Aldi to cover the cravings. So, flawless zebra/tiger hybrid presentation, fantastic thick chocolate and a wonderful flavour. An effortless Easter win from a supermarket own brand Easter egg! Okay so this is possibly the best chocolate milkshake for you, although it's not a milkshake per se. It sports itself as dairy free has no refined sugar, no additives or preservatives, it's organic, it's gluten and nut free, and it's also friendly to vegans. The ingredients show that it's low in fat and has natural sugar. It almost makes it completely guilt free asides for the fact that I'm just about to use it to wash down a huge milk chocolate Easter egg! On first opening it smelt surprisingly chocolaty. I even moved my huge milk chocolate Easter egg to make sure. It also tastes chocolaty. Okay so there was no whiff or flavour of milk or cream, but that's not necessarily a bad thing. Especially if you're lactose intolerant or don't particularly care because you're just about to eat a huge milk chocolate Easter egg. 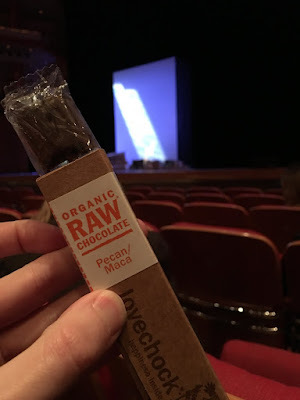 There was an initial chocolaty hit from the cacao fortified by natural sweetness from the dates, followed by the coconut milk to finish off with. Very nice indeed and I'd certainly have it again. Now where did I put that huge milk chocolate Easter egg? 330ml carton has 52 calories, 2g of fat, 7.4g of sugar and 0.05g of salt. Ingredients include; spring water, organic coconut milk, organic date nectar, and organic cacao. Herhsey’s milk chocolate is not my favourite chocolate, not by a long shot. I find the flavour something akin to Marmite. Generally speaking the people brought up the United States are in the Love camp and the rest are are in the other camp. It is a good example of how your upbringing can influence the flavours you like, and I’m sure it is something we have all experienced. Anyway I have had the Hershey's Cookies 'n' Creme bar before, and as that doesn’t have the “sour” flavour I associate with Hershey’s milk chocolate, I really enjoyed it. 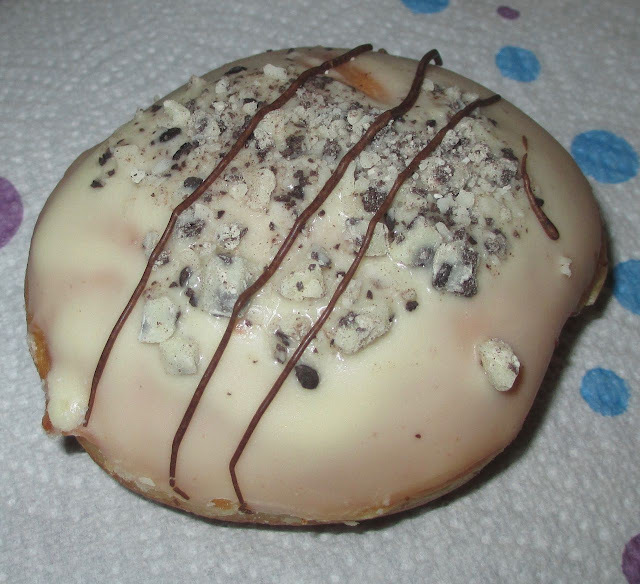 This helped my decision to try the new treat from Krispy Kreme; Hershey’s Cookies 'n' Creme Doughnut. The doughnut is topped with a white icing, Hershey's Cookies 'n' Creme pieces and a drizzle of chocolate. It is filled with a Cookies 'n' Creme filling too. When I bit into the doughnut the first thought I thought was about how good the vanilla taste was. 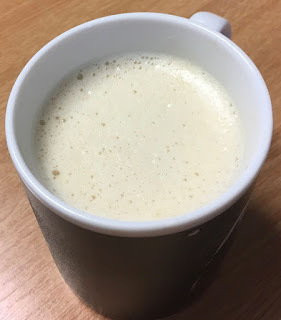 It was so very creamy, and sweet and the vanilla was wonderfully defined. The filling was thick but whipped so it was light and fluffy too. The doughnut was the usual firm but fluffy base. There were tones of white chocolate too, and it was like a homage to all thing creamy and vanilla flavoured. It reminded me of the best vanilla frosting you get on a cupcake, and I absolutely loved every bite. Pure luscious creamy heaven. Never ever think delicate flavours like vanilla or white chocolate are plain, sometimes they are just perfect. My local branch of Subway has had this particular new Sub advertised with a "coming soon" sign for some time. It has now finally arrived so it was the obvious choice for my lunch. 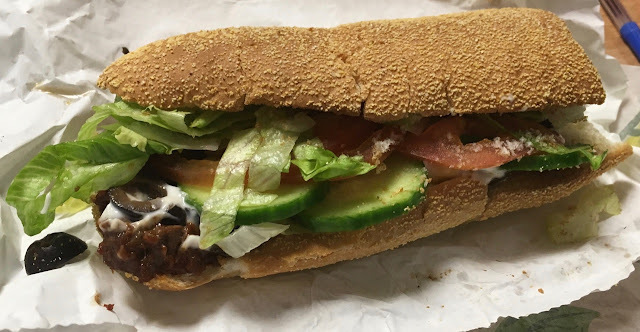 I ordered the BBQ Beef Burnt Ends Sub with salad, (lettuce, tomato and cucumber) and olives (I have these on every Sub, whether they sound like they would go or not) and I just had some mayo as the dressing, as I wanted to pick up as much of the main flavour from the meat as I could. The name of this Subway is a bit weird, but I have to say I did Google it and it made a bit more sense. Normally the idea of the "burnt ends" of anything sounds like the part you wouldn't want to eat, but apparently in the slow cooking and smoking process the Burnt Ends are a delicacy. If beef has been slow cooked a long time you would imagine that it would be ultra soft and would just fall apart. This beef didn't, if anything it was a bit chewy, which is rather unusual in a Subway sandwich. Further Googling showed that Beef Burnt Ends are often chewy... I am learning things tonight. The flavour was great though, the barbecues taste was spot on, not to strong, but a good mix of spice, and a lovely sweet and smoky flavour. I got used to the texture being a bit firmer, and enjoyed the rich meaty taste and salad. I have to admit to not knowing much about Beef Burnt Ends, but by the end of my Sub was left wanting to have it again, so it was a success. I like silly reviews. Often it's something that you probably shouldn't eat, but technically can, or a mix of unusual flavours. Here we have a novelty item that is clearly aimed at the Cat Dad segment, or the person who wants to buy a present for them. Cats do not need Easter Eggs, they probably don't care for a giant rabbit coming into their garden. Cats generally aren't fussed about chocolate, and why worry about resurrection when you have 9 lives? As you can see Duchess isn't that fussed about the egg. It's understandable - it's essentially things that cats don't really eat, like sugar and oil. The milk, yogurt and catnip are all things that cats like to eat though so I figured it was worth a shot. It also seemed fit for humans to sample too - only 2.4 % crude ash? Yum! So I cracked open the box and presented the egg in its entirety to Luna - hoping she'd try to crack it open. She went upstairs. I pushed down on the egg and it crumbled easily. I took a thin, but sizeable chunk and took a bite. It's very hard to describe the taste of food that isn't designed for humans as the flavours are on completely different dimensions. Imagine then if you took sweet vinegar with yogurt and mint and mixed them all together so that the flavours were really cheap but really intense. Give the food the texture of grit, and an aftertaste that just won't quit. Cat food has a strange quality to it at the best of times as anyone who has got cat food gravy on their hands or clothes and then smelt it too closely will attest. There are very few silly reviews that result in me regretting trying the food, but this is one of them. Cat Easter Egg does not taste like it should be eaten by any human. It tastes of regret. And largely the cats didn't seem interested either. Duchess loves milk, but isn't fussed about catnip. She licked it. She ignored it. Mabel eats any cheese like substance that falls on the floor. She ate the first bit of this I gave her, then she ignored the rest. We put this crumbled up first bit in one of the food bowls. The other two cats ate the biscuits around the easter egg but avoided the treat. Abject failure. I'm not sure whether this is due to my reaction to trying their special present before them, or just a reflection of how terrible this truly is - even on a cat scale. Like most pet gimmicks though this one is probably designed to be bought once and never again. We may leave some at the bottom of the garden to see if any of the strays like it, but i suspect it will just end up in the bin. De Brabandere Brewery in Belgium has recently created three Petrus sour beers by used brewing methods dating back to the 1800s. They use 100-year-old giant oak barrels, which grow wild yeast and probiotic (like yogurt) bacteria inside giving beer a sour taste. The first of the three I'll be trying is Petrus Oud Bruin, the other two being Petrus Aged Red and Petrus Aged Pale. I hope you are all enjoying the long weekend. 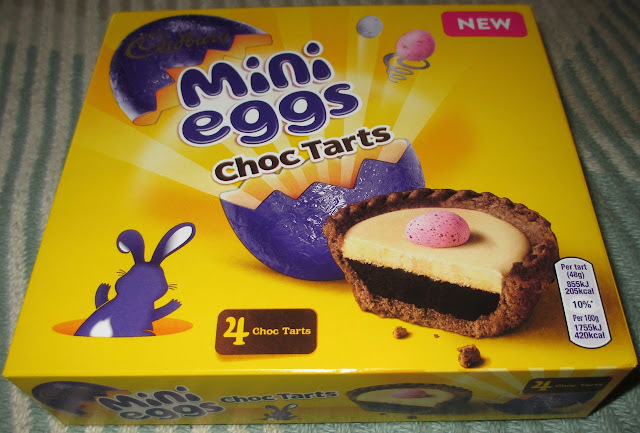 In order to begin our celebrations for Easter, we thought we’d start out by trying these new Mini Eggs Choc Tarts from Cadbury. There are four tarts in the box and they certainly look the part. 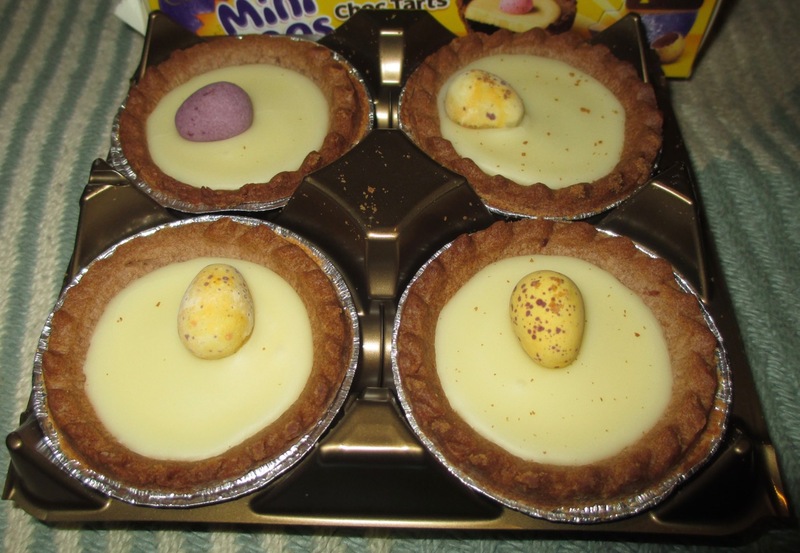 Each one is topped with a Mini Egg, so they are perfect for Easter. 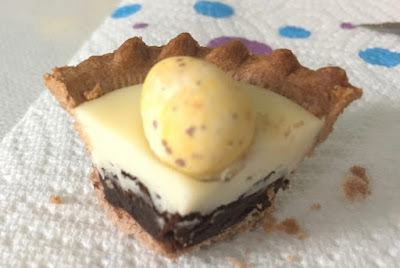 In the pastry case is a layer of spongey chocolate brownie, topped with fondant, and of course the chocolate mini egg. I took a bite and was a little surprised by just how dry they felt. The pastry is quite thick and combined with chocolate brownie, the whole thing had quite a stodgy dry texture. The fondant on top was the saving grace, but even that didn’t bring quite enough moisture or flavour for my tastebuds. Each mouthful was thick pastry first, then a hint of chocolate second. They were okay, it was nice when the chocolate tasted developed a little, but I thought they looked better than they tasted. I did enjoy the Mini Egg part though! In conclusion these tarts are sweet, have a nice novelty factor but aren't so impressive that I’ll be missing them once the season has gone. We still have plenty of other easter goodies and chocolate to enjoy, and hope you all do too. Happy Easter. Kettle are one of the great modern brands, so much quality and they practically redefined what a good balsamic vinegar crisp should be. Here we see their trip into the realm of the Lentil Curl, with a mozzarella and pesto flavour. strange. The cheese is a bit too feety, and the pesto just doesn't taste right. The lentils are a bit too hard too which is odd. I presumed that my partner would love these due to the cheesiness but she wasn't a massive fan either. She still ate them, but said she wouldn't buy again - which is a surprise. So these are the first disappointing Kettle thing, but the sun dried tomato bread we had with it was lovely! Looking at the packet I’m actually quite excited about eating these now. These dried Dates are sported as having only naturally occurring sugars, with no additives or preservatives, with low fat and salt, and a good source of fibre. In fact the packet states “naturally sweet and ready to eat.” So, I get it; healthy and not completely like fig rolls. On opening the packet I was slightly disappointed that the Dates weren’t heart shaped like the front of the packet – but there you go (just joking). Each date had been chopped in half and the stone taken out (as a favour to my teeth). Don’t get excited, as the ingredients state – these really are just Dates. However, it’s difficult to say “just Dates”. They are syrupy sweet and have an almost melt in the mouth texture. I’ve always said that grapes are nature’s sweet, however, these are most definitely also from Mother Nature’s Sweet Shop. How I’ve never tried Dates before is beyond me. They are really good washed down with a mug of spicy chai tea too. And so healthy, but I’d suggest you eat them in either the 25g sized fruit serving as one of your five a day or half the packet at a time, as they are quite filling as an after lunch grazing snack. Their syrupy sweet nature may also have you running around the office or maybe the gym! The 100g packet has 270 calories, 0.1g of fat, 68g of natural sugar, 0.03g of salt. Ingredients include; yes, you’ve guessed it: Dates. I do like a bottle of Shloer as a treat, and I’ve been particularly enjoying their red and white grape flavours without added sugar. As much as I like fizzy drinks I do pick the Diet editions, even if the drink is quite posh. I was pleased to see that the latest Limited Edition drink from Shloer is this Mango and Passionfruit and it also has no added sugar. It is sweetened with natural Stevia Leaf. The drink fizzed when we opened it, and I poured some into glasses. The drink is a little darker than the usual Shloer White Grape, but only a tone or so. It was lightly sparkling and not over fizzy. The flavour hadn’t been what I was expecting. I had assumed this was going to taste very strong and very sweet, I based this on the number of fizzy drinks I’ve had with mango in the past. However this is a very different affair. The flavour is quite acidic and has the main tang of passion fruit. There is a mellow aftertaste of mango that gives the drink a smooth finish, but the sharp natural tang of passion fruit remains the key player. The zingy nature of this drink makes it very refreshing, and very clean on the palette. The flavour is definitely aimed at the more mature market, as there isn't enough sweetness of mango to make this the kind of drink that kids naturally glug down, each glass deserves savouring. The Shloer Limited Edition Mango and Passionfruit is a very summery drink, and would be perfect chilled on a hot summers day, while taking in the sunshine. Here’s hoping we get a good summer, some opportunities for barbecues and excuse to enjoy the outdoors. Although I don’t put sugar in coffee, I do like coffees that are flavoured. Perhaps I’m repressing my inner sweet tooth but sugar in a coffee seems weird, but syrup; well let’s just say I have an addiction. I own a selection that puts most of the big brand coffee shops to shame… and also completely fills one corner of the kitchen. Chocolate Mint Latte anyone? Obviously I don’t take my stash of syrup bottles to work, so mostly I drink white unsweetened instant coffee while I’m there. 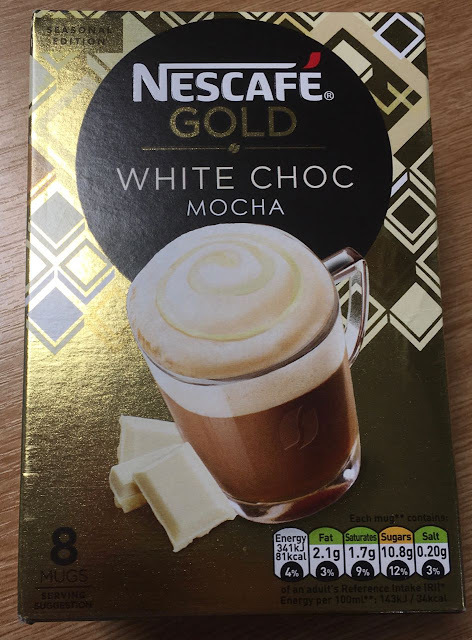 I did spot these fab looking sachets of the new seasonal edition Nescafe Gold White Chocolate Mocha drinks and thought I’d give them the taste test, and have a bit of a treat at work. I poured the contents of the sachet into a mug added hot water and gave it a stir. If you look at the instructions, it says to wait and then give it a second stir to ensure that all the bits get mixed in properly. It makes a huge difference and gets rid of all the lumpy bits. 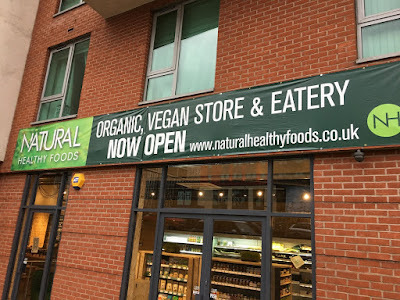 One evening in Birmingham I happened to take an unusual route due to trying to shelter a bit from the rain on the way to a restaurant - and spotted a new branch of a shop from Digbeth that we've talked about food from before. Naturally I had to go in and wait a little while for the rain to subside. And they actually had lovechock - in stock on a Uk highstreeet!! Follow the link if you want to see our first impressions, but suffice to say that this pecan/maca flavour is very similar in texture with a few different flavour elements packed in. Still amazing 4 years after we first found it! 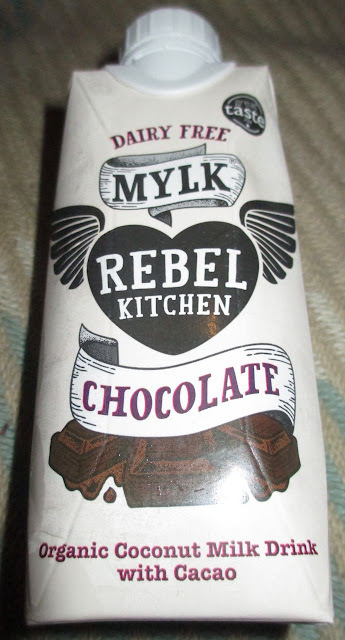 I'll probably talk about the vegan milk chocolate that is Mylk another time, and certainly have a better write up of the store. As you can probably tell though - we were here for Sushi! This is a fairly popular All-You-Can-Eat for £20 sushi bar in Birmingham called Kyoto sushi and grill. 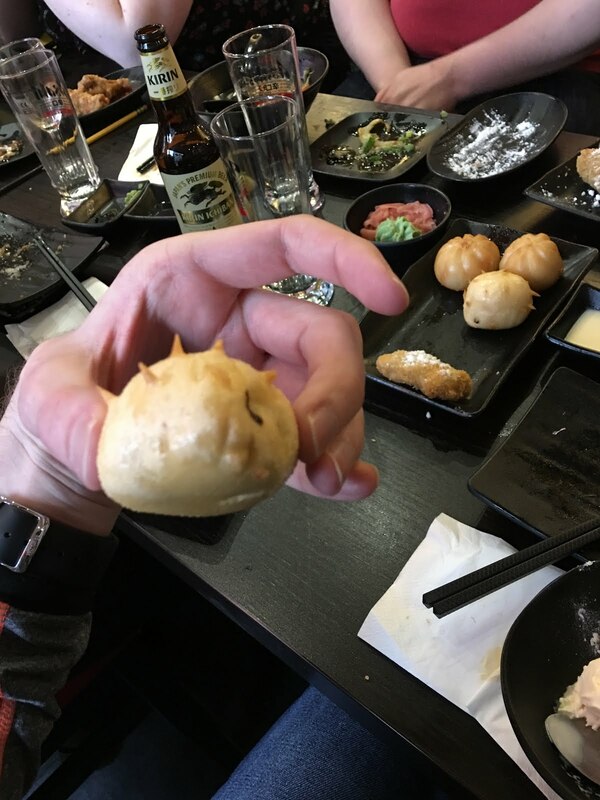 And it's the grill part that appealed to me - I can have all the different Japanese dishes in bite-size portions in one evening (and feel very, very full). 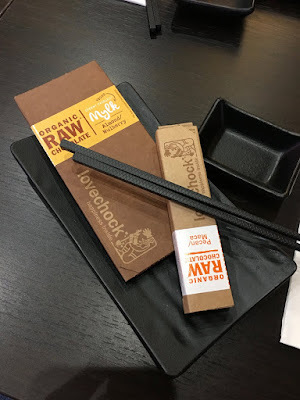 So, great as the Lovechock is we didn't actually eat any at the show on the day because we were just too full of Udon and other wonderful delights!